1982 - Jo was 16. Over the summer, Jo got her first job - Bedmaking at the local holiday camp with her best friend. Not the ideal job for two asthmatic teenagers with a dust allergy! But it paid £2.40 for three hours work which was the same as a paper-round paid for every day and twice on a Friday. Jo also dated her first boyfriend, this lasted about as long as her job did! Summer only and then back to school for her exam year. Jo was making more friends out of school thanks to her family moving house and discovering a love of rock music which was to define the rest of her life. Well first off I wasn't born quite yet that year (but hubby was ;)). When I turned 16 I had a surprise birthday party that my mom threw for me. Actually I had 3 parties! I got my driver's license and a new light purple Plymouth Neon. I think that's the only time I saw that color of car ever was the '95 Lilac Neon. I also had my first job (to pay for the car and the insurance) where I worked at a roller skating rink selling concessions. One of my worst jobs ever but one of my best quitting stories :) A little risque for here though! Thanks for taking part in the Birthday Blog Hop. Your 16th sounds great. Some of my friends got mopeds for their 16th but we can't drive cars here until you are 17 and no-one can afford the vehicle or the insurance anyway! First Jobs might be a good topic for a future blog hop. I'm sure we all have tales to tell about those, they are universally bad LOL. I love the Hallowe'en pictures too. You were stitching one of these when I found your blog so it's great to see two completed. Sounds like you had a great 16th birthday and I love your stitching choices. Very interesting stories and good to see those 2 completions. Hope green is going well! Love the 2 stitched pieces. Great to read about when you were 16! che bella storia e magnifici i ricami! Nice to read both your stories about being 16. But what was that about quitting your first job? You made me very curious, lol. A great Halloween piece that you chose for Jo's birthday. I'm hopping along on the blog hop. What a fun post. Thanks for sharing. Now I'm curious about your quitting story though haha. 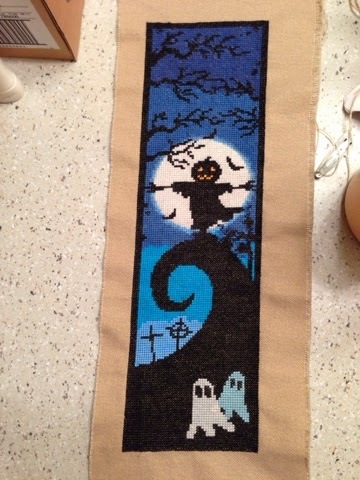 Love your two Halloween pieces! I am slowly hopping through the birthday blog posts. I enjoyed reading your very interesting post (love your floss background!). This is such a nice thing to be involved in. Oh, I love those little Halloween finishes of yours! So very cute. Love the Halloween pieces. Thank you for sharing! Lovely Halloween pieces but now we all want to know the quitting story! lol!